Taking off a couple days to relax often seems a bit of a mixed blessing — there’s always that much more to do when you get home. But who wouldn’t want a couple of days idleness with Robert who always feeds us as if he’s expecting to harvest pâté from our overstuffed bodies? I actually even read, too, while Robert bustled around cooking prime rib the first night and goose the second (not to mention the various other tasty tidbits, all washed down with copious wine). Miss Wendy joined us for the second day and much merriment, calling family members from all three families and watching movies. She was even kind enough to give in to my wheedling when she got the pirate tattoo from her Xmas cracker and I wanted to trade the horn I got for it — yay! Sign of a good friend — now I owe her. You can see how I have carefully maintained it. How long can it last? If only all the news were good: I feel the same chill of foreboding at the assassination of Bhutto that I did when the buddhas were destroyed by the Taliban. If the outcry in March 2001 had been louder, would we all be in the same situation we are now? My friend Gerry, the craftsman who made my first kantele, sent along this video of a piece of music with the wish that we all find peace in ourselves as a place from which to start to bring peace in the world. A lovely peformance — and a nice reminder of the power of music to heal. ARRRR! 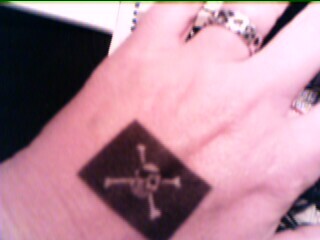 !That be the Mark of the Jolly Roger…it’ll stay with ye in ye heart thru thick and thin…ARR! Yo ho ho! I knew I could count on you, Black Ethel! Arrrr!